Japanese Episode AG 101: "The Battle of the Shaking Island! Dojotchi vs. Namazun!!" On the way through the Houen Region, Satoshi and his friends come across an island that won't stop shaking! The cause of the earthquakes is revealed to be the Namazun who lives in a nearby lake, and now it's up to Satoshi and his friend to stop the pokemon! So here's what happened: on October 28th, 2004, the second part of the Fuu and Ran battle aired in Japan as expected. The episode's end credits roll, and the Next Episode Preview comes on...only it's for "The Man of the Sea! The Four Emperors' Genji Appears!! ", not "The Battle of the Shaking Island! Dojotchi vs. Namazun!!" At first I thought that the information that we fans had regarding future episode titles was incorrect, but it turns out that the episode about Namazun was indeed meant to air. It was all very confusing until a few days later when, according to various news sources, the episode had been delayed because of a series of earthquakes that had ravaged Japan earlier that week. 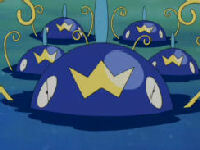 The earthquakes left lots of people dead, injured, and homeless, and it was decided that airing an episode of Pocket Monsters Advanced Generation dealing with the same type of disaster would be too much at the time. So, TV-Tokyo decided to indefinitely delay the episode's airing. A Next Episode Preview did emerge on the Internet (you can see some screencaps I took from it here), however. The source of the video isn't exactly known, but it's assumed that some areas of Japan aired it and some didn't. My guess would be that, for whatever reason, certain TV-Tokyo stations around the country didn't get the version with the "correct" preview and had to air the older preview instead and that someone lucky enough to live in one of the areas that aired the older preview managed to tape it. Since the episode was skipped in Japan, it was also skipped in the U.S. and everywhere else. It's likely that TV-Tokyo didn't even give the episode to 4Kids for them to dub, so, like the Porygon episode, this one will never see the light of day in the U.S.